A new NASA challenge is looking for evidence to support a theory that electromagnetic pulses (EMP) may precede an earthquake, potentially offering a warning to those in the quake’s path. 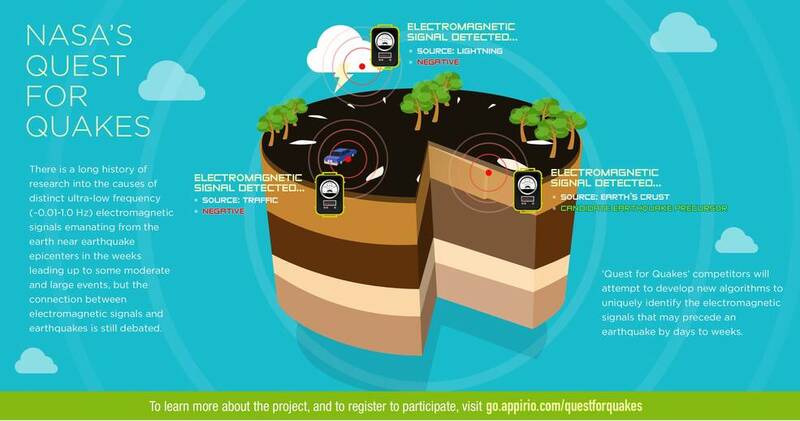 The “Quest for Quakes” two-week algorithm challenge seeks to develop new software codes or algorithms to search through data and identify electromagnetic pulses that may precede an earthquake. Some researchers have speculated such pulses originating from the ground near earthquake epicenters could signal the onset of some quakes. One theory suggests that fracturing rock in the Earth’s crust creates an electrical charge pulse that travels to the land surface and manifests itself as a small change in the local magnetic field. However, there are a number of natural and human-made electromagnetic ‘noise’ sources, such as lightning, solar storms, commuter trains, and traffic, that can mask or mimic EMPs and could be associated with earthquakes. The data for this competition was provided by the QuakeFinder group, a humanitarian research and development project by Stellar Solutions, Inc., Palo Alto, California. QuakeFinder has 125 sensors in California and 40 sensor suites around the world. These ultra-low frequency magnetometers collect and transmit high-rate data to Stellar Solutions’ data center for management and evaluation. Over 65 terabytes of data have been collected from sensors along the San Andreas fault and other faults in California, Chile, Peru, Greece, Indonesia and Taiwan. “The “Quest for Quakes” contest is a great example of how the AWS Cloud infrastructure is ideal for many different research and scientific workloads,” said Jamie Kinney, AWS senior manager for scientific computing. “We are looking forward to the innovative applications that contestants develop to address this real-world challenge and may also save lives." The ”Quest for Quakes” challenge is managed by the NASA Tournament Lab established by NASA and the Crowd Innovation Laboratory at Harvard University in 2010 to create the most innovative, efficient and optimal solutions for specific, real-world challenges being faced by NASA researchers. The lab is using Appirio’s topcoder.com crowdsourcing service to host the challenge, which is open to the public and the more than 815,000 members of the topcoder community.